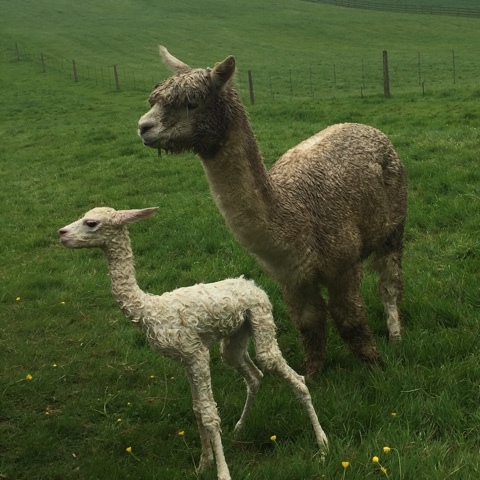 The first Cria of 2016 was born today in the rain. A white girl from Shanbrooke Accoyo Tsar of TOFT ET out of TOFT Ambarona. We haven't weighed her yet but she looks a big un. So much for being born on a sunny day before 3.30pm. Obviously Mum couldn't hang on as the rain has been fairly constant today, if not heavy, from about 1am. So there we go first one on the ground for 2016. Mum and babe all well and only 47 to go. We shall call her Alyona which is a touch Russian after her Dad.